Maybe this excites you. Maybe it makes you groan with annoyance or painful emotions. No matter your reaction, I think it needs a rewrite. When a knee-jerk holiday or observance day rolls around on the calendar, my inner, anti-commercialized and ‘make it all meaning-full’ voice asks: What’s this about? How could it be truly significant? Instead of waiting for society to come around, I infuse meaning by creating a practice of my own, a ritual of some sort. Let’s do that with this day, the day of Love, which gets primarily cast in the vein of romantic love. But what about those who don’t have a romantic interest or partner? We’ve all been – or currently are – in that position. Much of the time, that feels like crap, like all of the other holidays and celebrations that are exclusive, such as Mother’s Day and Father’s Day. Can’t we just celebrate each other and all beings, all of the time, as in every day? I propose we celebrate and love on ourselves first, then we are much better equipped to share our love with others. 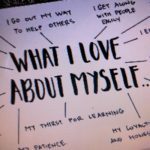 “If you can’t have a self-love fest once in awhile, how can you expect anyone else to? ? I love this practice and have taken up the challenge. Will you? When you are having a rough day and cannot find one good thing about your life or yourself, take out your colored pencils/pens and some nice paper and begin your list. Then how to find the list in my clutter house when I need it! hahahaha Kidding. Thank you, Kristen! Indeed Love is not exclusive. Keep looking for its evidence with scanning eyes and a wide open heart.